the red chilli pickle recipe is a banarsi style stuffed red chilli pickle. the red chilli pickle aka lal mirch ka achar tastes awesome. you can have it with chapatis or rice or parathas or with any indian meal. rinse 300 grams fresh red chillies or 12 to 14 fresh large red chillies with water a couple of times. then wipe dry each red chili with a kitchen cotton napkin. the chilies have to completely dry before you proceed with stuffing them with the pickle masala. remove the crowns from the red chillies. then with a knife make a slit on each red chilli. ensure that you slit the chilli only one side and keep it whole. with the back handle of a small spoon scrape of the seeds and pith from each red chilli. once you remove the seeds and pith from each red chilli, then cover them and keep aside. take 4 tablespoons mustard seeds (rai), 6 tablespoons fennel seeds (saunf) and 3 tablespoons fenugreek seeds (methi seeds) in a small grinder jar or coffee grinder. powder the spices coarsely. do not make a fine powder. take the coarsely powdered spices in a mixing bowl or pan. also add 5 tablespoons dry mango powder (amchur powder), 2 tablespoons turmeric powder, ¼ teaspoon asafoetida (hing) and 3 tablespoons salt. add 4 to 5 tablespoons mustard oil in the coarsely ground pickle masala. this is to moisten the masala so that it can easily be stuffed in the red chillies. mix very well. take a portion of the pickle masala and stuff in each red chilli. this way stuff the masala in all the red chilies. now place each stuffed red chilli in a clean glass jar or ceramic jar. either you can sterlize the glass jar or keep it in sun with its lid for a couple of hours. add any leftover pickle masala in the jar. then pour 1 cup mustard oil in the jar. close the jar with its lid. then shake the jar, so that the mustard oil coats all the red chilies. remove the lid. place a muslin cloth on the mouth of the jar. secure it tightly with a string or rubber band. place the pickle jar in the sun. during evening, remove the jar from your window sill or balcony or terrace and keep in a dry place in your kitchen. next morning again keep in the sun. shake the jar everyday before keeping in sunlight. overall keep in the sun for about 5 to 7 days. to check if the pickle is done, is to taste the red chilies. it there is crunchiness in it, then some more days will be needed for the red chilli pickle to mature. the red chilies should soften due to the heat from the sunlight. 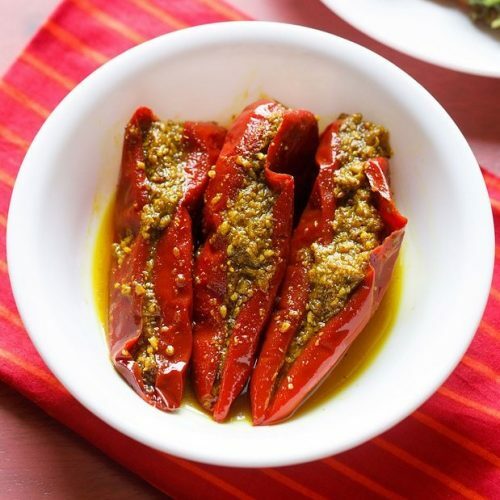 once the red chilli pickle is matured, then you can start serving it with your meals. once the red chilli pickle is done, then you can keep in fridge or keep the jar in a cool dry place.